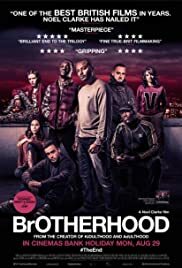 First, there was Kidulthood, then Adulthood, and now comes Noel Clarke's lastest instalment: Brotherhood. Sam is facing up to the new world. He realises it also comes with new problems; new challenges he must face which he knows, will require old friends to help him survive new dangers. Yardz, Chest: [laughs] Blood? No one says that anymore Cuz! i can't stand movies that don't have any sort of music or acting or new ideas or good story,it just depends on some weak actions and some pretty girls, nothing else. i think that kind of movies doesn't respect you or value your knowledge about creative movies.it's such wasting time doing nothing expect watching guys and girls without clothing where's the idea or the main purpose of the movie ?